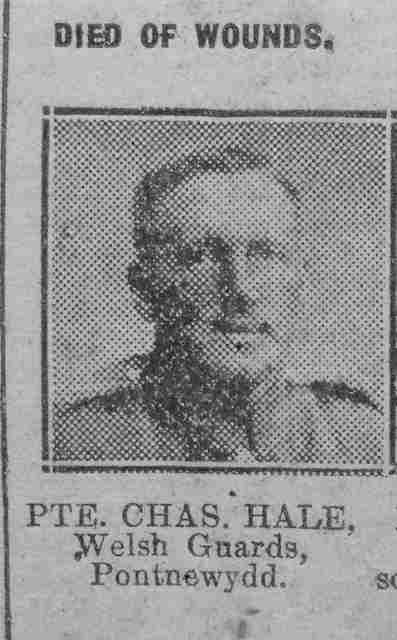 Hale, G, 36, 4th December 1917, 1st. Bn. 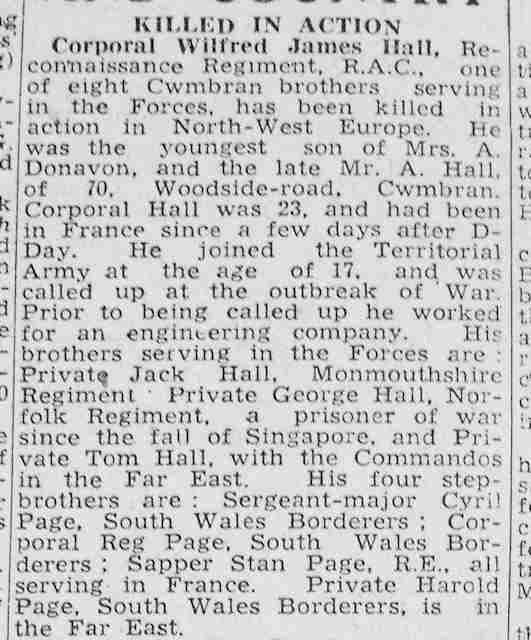 Welsh Guards, 3642, Private, Son of Theodore and Louisa Hale, husband of Bula Kate Hale, of 9, Station Rd., Pontnewydd, Mon., TINCOURT NEW BRITISH CEMETERY, III. E. 14. 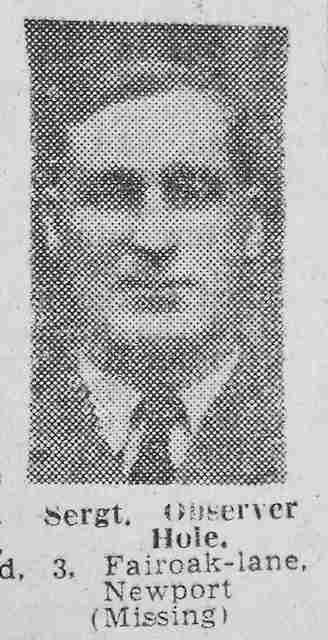 Hall, Tom Allen, 33, 12th September 1915, "B" Bty. 75th Bde. 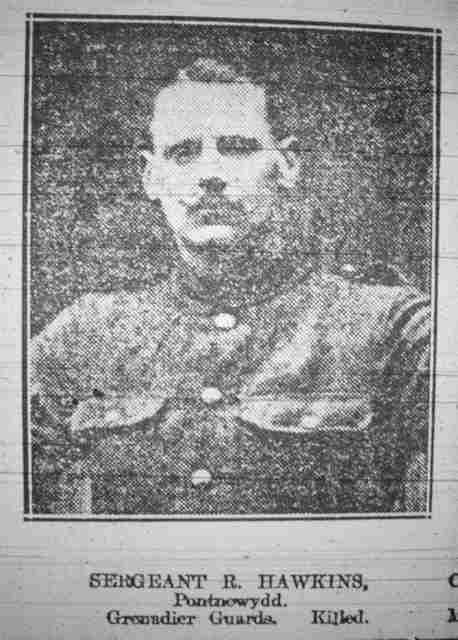 Royal Field Artillery, 25586, Serjeant, Son of Thomas and Mary Hall, of Pontypool Rd., Newport, Mon., ROYAL IRISH RIFLES GRAVEYARD, LAVENTIE, I. G. 5. 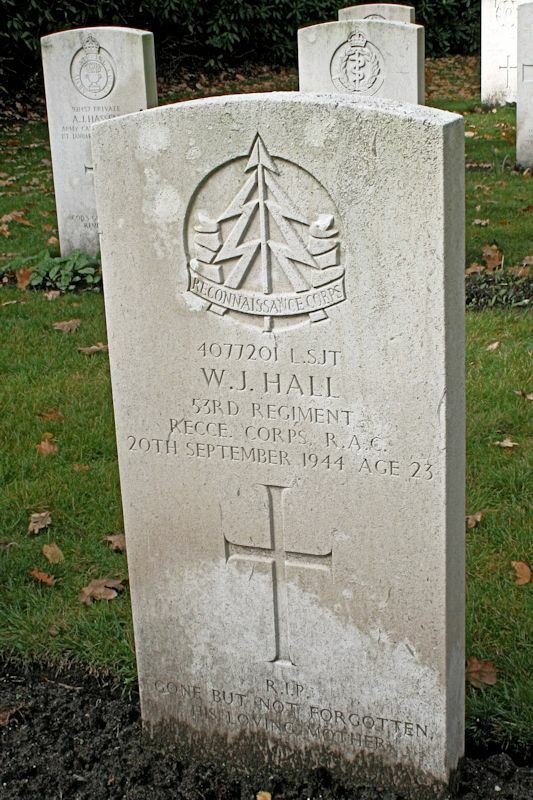 Hall, Wilfred James, 23, 20th September 1944, 53rd Regt. Reconnaissance Corps, R.A.C., 4077201, Lance Serjeant, Son of Albert and Alice Hall, of Cwmbran, Monmouthshire, MIERLO WAR CEMETERY, VII. B. 3. Hardy, John James, 29, 16th April 1943, attd. H.Q. 6th Inf. Bde. Army Catering Corps, 3908203, Corporal, RANGOON MEMORIAL, Face 19. 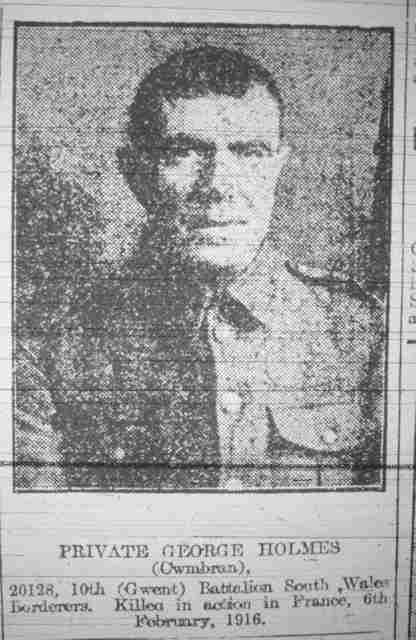 Harris, Sidney John, 34, 8th February 1942, General List attd. 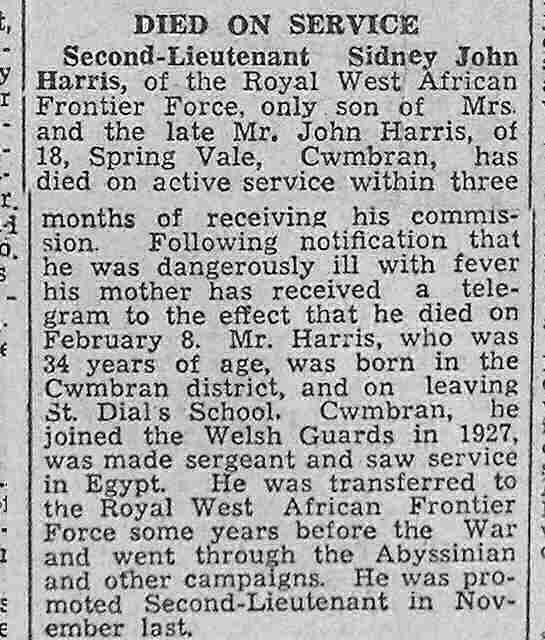 3rd Bn Nigeria Regiment, R.W.A.F.F., 227443, Lieutenant, Son of John Henry and Edith Mary Harris, of Pontnewydd, Monmouthshire, IBADAN (ST. ANNE) CHURCH CEMETERY, Grave 17. Harris, William Francis Harold, 30, 30th January 1941, Royal Irish Fusiliers, 7047064, Fusilier, Son of Arthur and Sarah Ann Harris; nephew of Maria Roberts, of Llantarnam, Mon., TYRELLA CHURCH OF IRELAND CHURCHYARD, Grave 2. 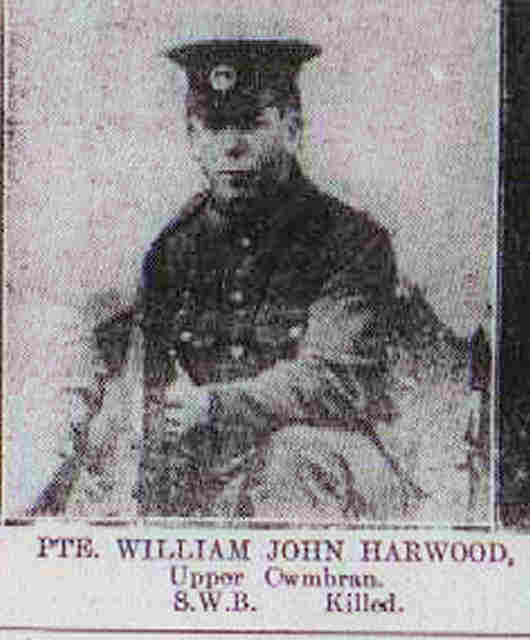 Harwood, William John, South Wales Borderers, Upper Cwmbran, Monmouthsire. Hawkins, Robert, 26, 25th September 1916, 2nd Bn. Grenadier Guards, 15025, Serjeant, Son of John and Jane Hawkins, of Brynhyfryd, Mount Pleasant, Pontnewydd, Mon., GUARDS' CEMETERY, LESBOEUFS, I. A. 7. Hayles, Noel Alfred Douglas, 10th May 1915, 13th Bn. Australian Infantry, A.I.F., 616, Private, Son of Alfred William and Maud Mary Hayles, of Armidale, Pontnewiydd, Mon., England. 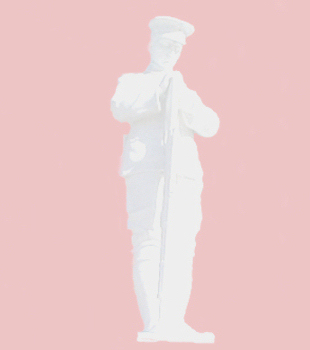 Born at North Shore, Sydney, Australia, LONE PINE MEMORIAL, 38. 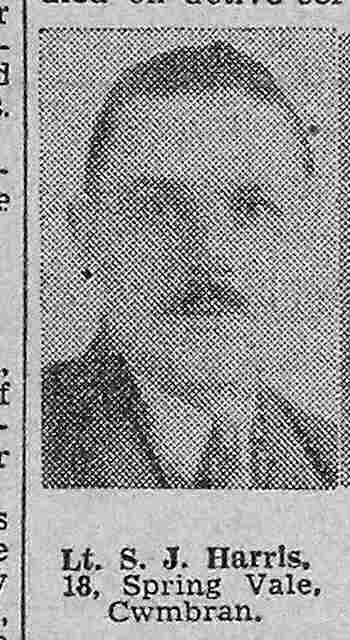 Head, H, 7th November 1918, transf. to (202371) Labour Corps, 3rd Monmouth Bty. 4th Welsh Bde. 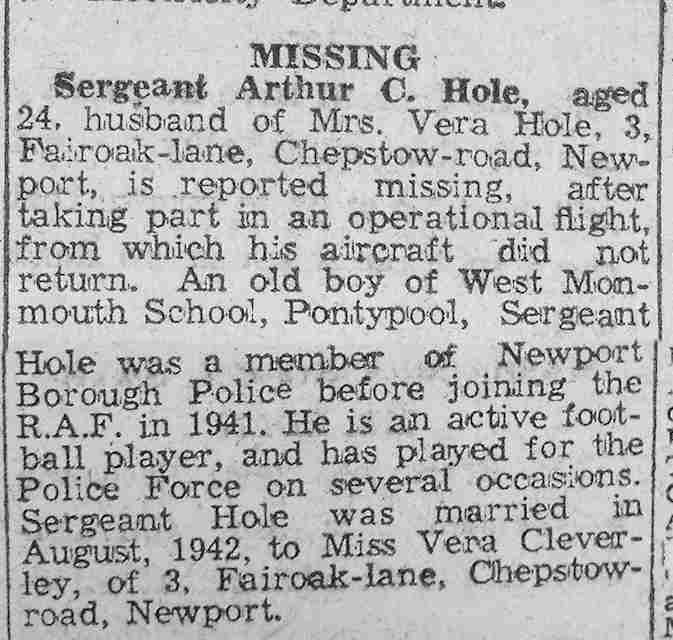 Royal Field Artillery, 688, Driver, CWMBRAN CEMETERY, A. 15. 19. Heastie, W K, 4th September 1917, 3rd Bn. Grenadier Guards, 23699, Private, DUHALLOW A.D.S. CEMETERY, VII. B. 2. 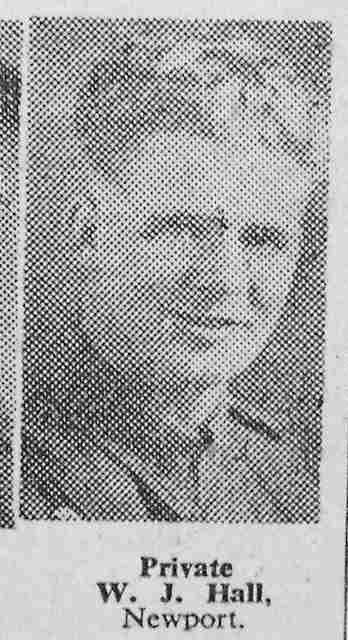 Hicks, Herbert John, 25, 29th November 1941, 1st Bn. Essex Regiment, 6021243, Private, Son of John Langdon Hicks and Emma Frances Hicks, of Pontnewydd, Cwnbran, Monmouthshire, KNIGHTSBRIDGE WAR CEMETERY, ACROMA, 2. C. 18. Hinton, Alfred George, 38, 15th August 1916, 256th Tunnelling Coy. Royal Engineers, 158153, Sapper, Husband of Louisa A. Jones, of 140, Llantarnam Rd., Cwmbran, Mon., MAROEUIL BRITISH CEMETERY, III. D. 7. 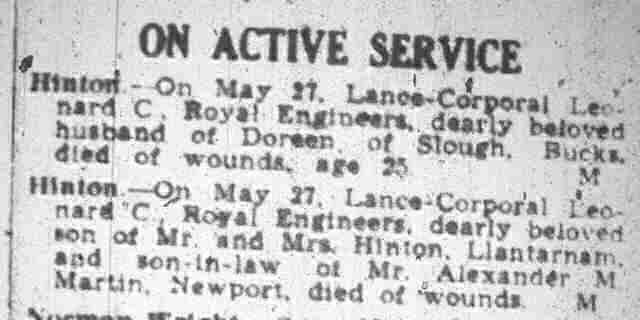 Hinton, Leonard Charles, 27, 25th June 1940, 1 Boring Coy. Royal Engineers, 2183358, Lance Corporal, Son of Thomas John and Doris Hinton; husband of Florence Doreen Hinton, of Slough, Buckinghamshire, HONDSCHOOTE COMMUNAL CEMETERY, Row C. Grave 6. Hocking, John Samuel, 24, 3rd September 1944, H.Q. Sqdn., 11th Armd. Div. Royal Armoured Corps, 3912645, Trooper, Son of John and Florence Hocking; husband of Nelly Doreen Hocking, of Sebastopol, Momnouthshire., LONDON CEMETERY AND EXTENSION, LONGUEVAL, Plot 13. Row C. Grave 4. 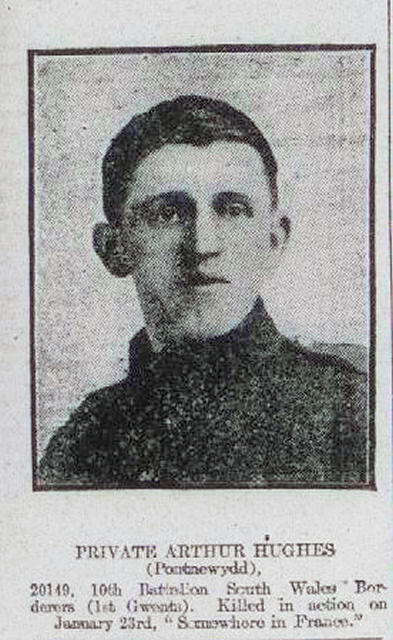 Holcombe, Francis, 30, 10th July 1916, 14th Bn. 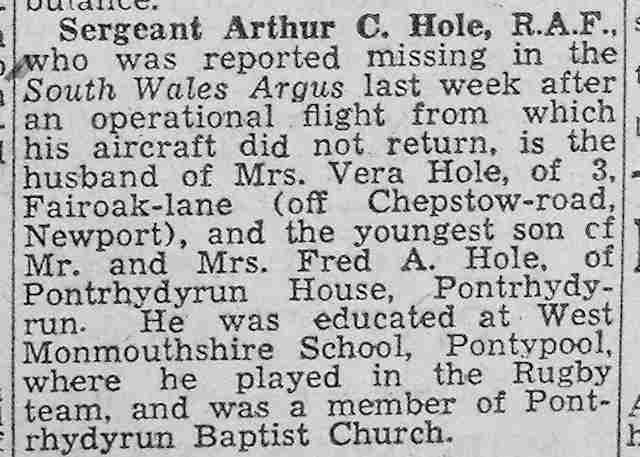 Welsh Regiment, 35413, Private, Son of John and Ann Holcombe, of Old Farm, Pontrhydyrun, Newport, Mon., THIEPVAL MEMORIAL, Pier and Face 7 A and 10 A.
Hole, Arthur Charles, 26th February 1943, Royal Air Force Volunteer Reserve, 158 Sqdn., 1338760, Sergeant (Nav./Bomber), FLORENNES COMMUNAL CEMETERY, Row 1. Grave 15. 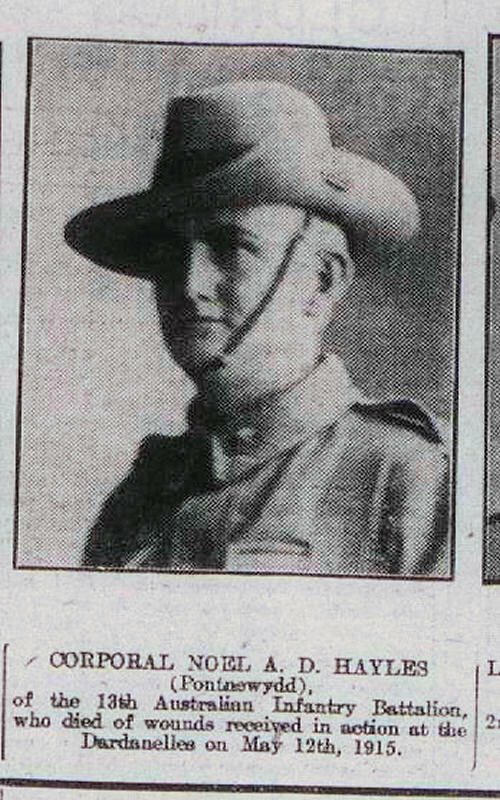 Holmes, Frank, 34, 17th January 1921, H.T. 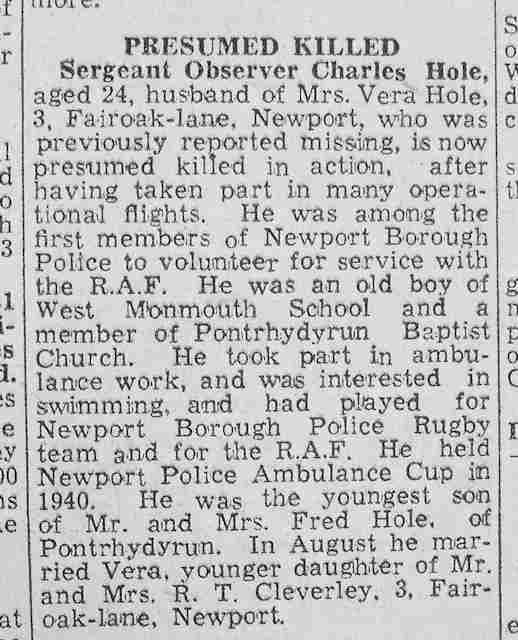 Royal Army Service Corps, T/384710, Private, Son of the late Henry and Julia Holmes, of Cwmbran, Newport, Mon., CWMBRAN CEMETERY, D. 3. 6. 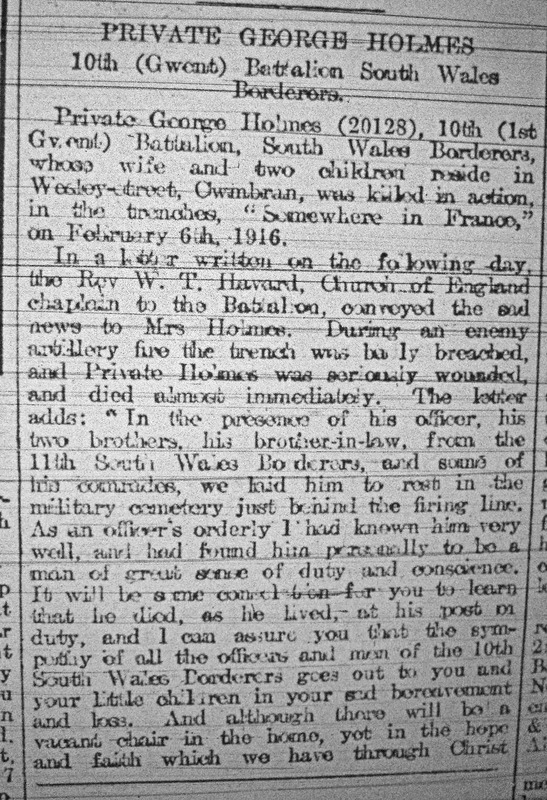 Holmes, George, 6th February 1916, 10th Bn. South Wales Borderers, 20128, Private, ST. VAAST POST MILITARY CEMETERY, RICHEBOURG-L'AVOUE, II. O. 7. Homan, Vivien, 19, 14th August 944, 4th Bn. 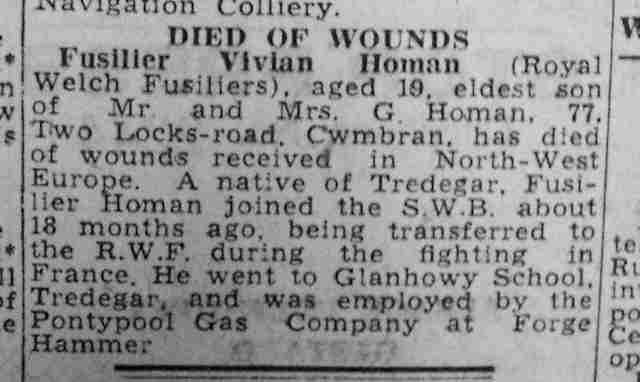 Royal Welch Fusiliers, 14552218, Fusilier, Son of George and Ellen Homan, of Cwmbran, Monmouthshire, BANNEVILLE-LA-CAMPAGNE WAR CEMETERY, VIII. E. 5. Hopkins, William Henry, 26, 15th October 1941, 7/4 Maritime Regt. Royal Artillery, 1722175, Gunner, Son of Sidney and Blanche Hopkins, of Cwmbran, Monmouthshire; husband of Irene Katie Florence Hopkins, of Cwmbran, PLYMOUTH NAVAL MEMORIAL, Panel 62, Column 3. Hughes, Arthur, 21, 23rd January 1916, 10th Bn. South Wales Borderers, 20149, Private, Son of Mrs. Bessie Hughes of "Tyny-Graig," Chapel St., Pontnewydd, Newport, Mon., RUE-DU-BACQUEROT No.1 MILITARY CEMETERY, LAVENTIE, II. E. 18. Hulbert, Thomas, 20, 1st February 1917, 11th Bn. South Wales Borderers, 20012, Corporal, Son of John and Sarah Hulbert, of Maes-Y-Rhiw Cottage, Cwm-Bran, Newport, Monmouthshire, FERME-OLIVIER CEMETERY, Plot 2. Row G. Grave 5. Hunt, Stanley Gordon, 4th May 1915, 1st Bn. Monmouthshire Regiment, 2414, Private, WIMEREUX COMMUNAL CEMETERY, I. F. 27A.